We have enough monkey stuffed animals to fill a barrel here at StuffedSafari.com so we know stuffed monkeys and plush monkeys are super fun. Actually, they're as fun as a barrel full of monkeys. Literally. We've done the math. We used complex equations and calculations to come to this groundbreaking conclusion that we plan to publish in the Journal of Stuffed Monkey Science someday. You know, when we get around to it. Who has time for getting published when there are so many monkey stuffed animals around to play with? 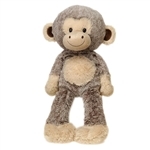 We have plush squirrel monkeys, stuffed macaques, plush spider monkeys, and many other types of monkey stuffed animals to keep us focused on what's truly important; having fun! We also have classic brown monkey stuffed animals, a plush monkey pillow, and pink and purple stuffed monkeys that are extra silly. It's plain to see that we don't monkey around when it comes to providing a huge variety of stuffed monkeys and plush monkeys. Scroll down to check out these monkey stuffed animals and prepare to go bananas! It's just that fun!